A great place to work – that is inclusive, flexible, modern and connected, encouraging openness, challenge, innovation and excellence. Launched at Civil Service Live this summer, thousands of you have already heard about the vision first hand from John Manzoni, our Chief Executive. The colourful new branding made a big impact, and more of you will have seen it since in your offices, at recruitment events, in local academy sessions and on social media. More importantly, many of you are already demonstrating daily great examples of A Brilliant Civil Service. Civil Service Live was full of stands and presentations of the great work we’re already doing across the UK. We now need to build on all these great examples, and make sure that in every part of the Civil Service, and every day, we live up to our vision. Just as the vision has been developed with contributions from civil servants at all grades, across many regions, departments and professions, everybody has a role to play in making it a reality and the chance to benefit from it. We’ve already put in place some key building blocks. 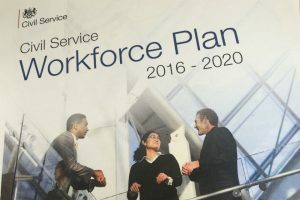 For example, the 'Skilled people' pillar is being delivered through the Civil Service Workforce Plan, also launched this summer. This shows our commitment to building stronger career paths and development opportunities in those areas where we need to build capability, such as commercial and digital. The Workforce Plan also covers one of my overriding priorities: to be the UK’s most inclusive employer. In doing so we will ensure that the Civil Service is a place to work that is open to all, regardless of background, where everyone can be themselves, and where different points of view are positively encouraged. In the same way, the ‘Effective leaders’ pillar is supported by our Leadership Statement. In the coming months you will see many more ways in which the vision is coming to life and, we hope, create some of your own. It’s important to say that the vision does not replace departmental improvement strategies or plans. Rather, it can be a powerful way to focus our efforts as a Civil Service. At HMRC, for example, as part of the Building Our Future initiative, they are half-way through 50 events for 10,000 line managers, speaking to them about the vision and their personal responsibilities as leaders to create A Brilliant Civil Service. However, achieving our vision ultimately depends on you, and your team. I want everyone to lead by example, embracing the opportunity to be the best they can be. Providing a brilliant public service means accepting the scale of the challenges we face, including the accelerating pace of change in technology and public expectations. We’re all on the frontline of this challenge. Think about what the vision and its pillars mean for your own work and priorities. How can you contribute to improving outcomes for the customers you serve? Take responsibility for how you improve, do things differently and inspire your colleagues to do the same. And, most importantly, share your successes. 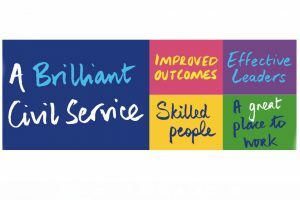 I intend to launch a new monthly award that will recognise and reward great examples of A Brilliant Civil Service in action, but I need to hear from you. Find out more about the vision. You can search for it on GOV.UK and keep up to date with developments here on the Civil Service blog. Last but not least, speak to your leaders about the vision. They are integral to its delivery and you should hear from leaders in your own departments shortly about how it will be made a reality where you work. Can I get a job working in this brilliant civil service you describe, as I do not recognise it from the one I work in? PS, the link to the Civil Service Workforce Plan is just http://h, that doesn't bode well. Thanks for spotting that broken link - now mended. Sir Jeremy, I'm afraid I have to agree with Bill. There are very few happy and content with work people in here. We have had pay cuts with the pension contribution increases; a 10 year pay restraint; proposed 30% staff cuts; more consultants that civil servants in this building; a worsening of our terms and conditions; and we still hate the PAR system. None of these have been addressed by the last few years of the Have Your Say Survey and, perhaps, it might have been better for you to wait until the results of this year's survey before launching the Brilliant Place to Work campaign. Because frankly, and with respect, not to many of us think it is brilliant, or has been, for the last few years. The words cloud, cuckoo and land come to mind. You've got rid of a lot of us. The ones who remain get none or pitiful pay rises. We do take pride in our work, but not because of you and your "brilliant civil service" but because we have our own standards. We don't need to be told to take responsibility, but rather senior management should take an interest in looking after their staff. I think I sense a little cynicism? Well let me tell you this: I recently heard a senior manager say how 50 million customers get him out of bed in the morning. I thought about this and had to admire his dedication. I suspect a considerable sum of money was spent on the new 'branding'. We, meanwhile, have had a laminated sign blue tacked to the outside of our building for four years advertising our Department! Speaks volumes doesn't it?! We have just been given a new system which is NOT built round our need but cobbled from a PT Ops use and half the options on it do not relate to our work . This is not using a trusted and efficient System this is the usual fudging for the sake of cost. Colourful branding does not make things better; the only thing holding the CS together is The People it employs who are constantly adapting to change and many of whom will be adapting to not working here anymore. As a taxpayer I am worried about the time spent on creating Vision after Vision. Lets just get on with the work. I was encouraged to read about "our commitment to building stronger career paths and development opportunities (and) a place to work that is open to all, regardless of background". However, I then took a look at the Civil Service Jobs site, and the jobs available at my grade (SO). Of the 24 jobs listed on the first page, I had to immediately discount almost 90%, as they either required very specific qualifications (degrees/post-grad degrees in specific field, BSC/ISEB Certification, Prince 2, APM/IPMA, IEMA, qualified accountant status....), or incredible levels of experience (5 years in field was regularly quoted, or "comprehensive knowledge/specialist knowledge" within the particular field). Just three jobs indicated that they would accept applications from candidates based on competencies, with study and qualification in their particular disciplines being required for the successful applicant - and I can assure you that my only surprise was that there were as many as 10% of the jobs willing to take on someone outside of their own closed community. While it may well therefore be the case that Career Paths are being championed, my experience is that development opportunities (and by inference, the opening of posts to wider backgrounds) is very much NOT on the agenda. Perhaps by the time I reach SO level, I should accept that I should be pigeonholed into a particular field with no opportunity within the Civil Service to change (though that would be more palatable had I not taken promotion in a particular career path that was shortly after dispensed with in my Department) - but I would hope that, in the interests of building a truly adaptable, flexible, diverse, and innovative workplace, there would be more focus on appointing well-rounded individuals who would then be trained in the particular skills required. I would love to work in a Civil Service with values of integrity, honesty, impartiality and objectivity but unfortunately that particular Civil Service doesn’t exist right now. One massive step towards it would be to replace the reporting regime that Civil Servants currently have to endure. The current Performance Management Reporting (PMR) system was imposed across Government Departments without any negotiation with staff or the unions. No-one likes it - PMR is widely discredited both inside and outside the Civil Service. It is hated by both staff and managers alike because the system is known to be discriminatory and unfair. Hundreds of thousands of hours and millions of pounds are wasted each year on mid year and end of year write ups, interviews, consistency meetings and form filling in this bureaucratic nonsense. PMR goes against those values of integrity, honesty, impartiality and objectivity in as much as it is neither honest, impartial, objective, nor has it any integrity. Mid Year and End of Year markings are gerrymandered to fit a ridiculous performance curve, regardless of the individual’s actual performance. Every year 10% of staff will be designated as “must improve” regardless of their performance simply because the guided distribution element says so. In some Departments, two “must improve” marking triggers a possible dismissal and also a “must improve” marking means no end of year bonus. For any organisation priding itself on “caring for staff” and “people engagement”, to accept at the beginning of the year that 10% of their staff will receive "a must improve" (with the consequent financial penalty) is defeatist at best, but then to actively pursue this is simply beyond words. 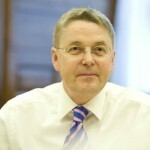 I would nominate, for the first of Jeremy Heywood’s new monthly awards, the person with the vision and courage to get rid of the current system and replace it with something that is fair and unbiased and fulfils the Civil Service values of integrity, honesty, impartiality and objectivity. The Award seems a great idea - I think we'd all agree that the Civil Service could do with more recognition of the hard, and vital, work Civil Servants do every day, which is sometimes all but invisible to the public, and I can't think that anyone would complain about being appreciated for a job well done (albeit we might all wish that such appreciation could be shown more substantially in salaries and other terms and conditions!). Is there any guidance on how/when nominations for the monthly award can be submitted? How about being an increase in salary, this may lead to increased productivity, more skilled people and a great place to work. People in ivory towers coming up with sound bites. To have a brilliant civil service you have to have enough staff to do the job, investment in the staff and infrastructure and ensure the staff treated with respect and properly rewarded for doing the job. This will motivate and encourage the staff to do their best and even have a passion. Unfortunately this is not likely to happen as instead the continuing cuts in staffing and pay mean an increasing dispirited and frustrated staff with no hope of any improvement on the horizon. A simple request to Sir Jeremy Heywood and Mr Manzoni. Kindly show me, and all the others that give the negative feedback on the blogs, where, when and why the Civil Service is A Brilliant Place to Work in sufficient detail to counteract the topics we raise on a constant basis. I.e. Pay restraint; pay difference between specialists in the CS and the private sector; 4 fold increase in pension contributions; the PAR system; no money for training in many areas; the increase in the number of consultants in many areas; skills shortages; and the proposed 30% cut in numbers. Don't forget the improvement in leaving terms starting yesterday. Firstly, in case you are wondering - I am not Bill. Secondly, I will not be cynical - I will say it as I see it. We (Civil Servants) have had 6 years of a pay restraint. We have had a 4 fold rise in pension contributions. We have a PAR system that is utterly discredited. We are due to be reduced by 30% (without an explanation on what we stop doing). We are short of specialist skills in several areas. We (in the MOD) have an IT system that won't easily open pdf files. I have always, and still do, wanted to do the best I can to help the Armed Forces, but in my opinion "things being a little tarnished" doesn't come close to the situation or make for a Brilliant Civil Service.